Songwriters Norman Gimbel and Charles Fox, at the early stages of prolific careers, had no idea they were writing the epilogue for singer-songwriter Jim Croce, a man who generally manufactured his own music and lyrics. But his performance of their "I Got a Name" on record sounded like something he'd have come up with eventually, and it ended up being the last song he'd perform on this earth, at a concert in Natchitoches (NACK-itosh), Louisiana, after which his charter plane would crash during takeoff on September 20, 1973. "I Got a Name" was scheduled for release as a single one week after that sad day and had already been assigned as the opening and closing title theme for a movie called The Last American Hero. 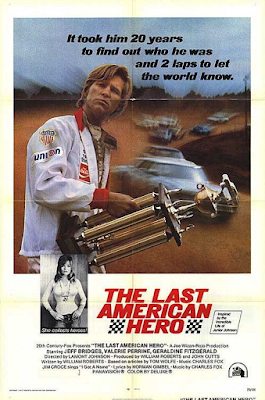 In spite of its big title, this was a fairly easy-going film starring Jeff Bridges as a charismatic and resilient Junior Johnson-style moonshiner-turned-stock car racer, the type Croce sang about on his 1972 You Don't Mess Around with Jim album ("Rapid Roy (The Stock Car Boy"). 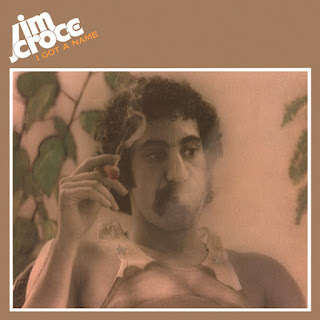 "I Got a Name" would be Croce's fifth charting single, with six more posthumous ones to come between 1973 and 1976, including the career/genre/era-apotheosis piece "Time in a Bottle." Side B merged lyrics that evoked the blue collar south to an etude-like track. 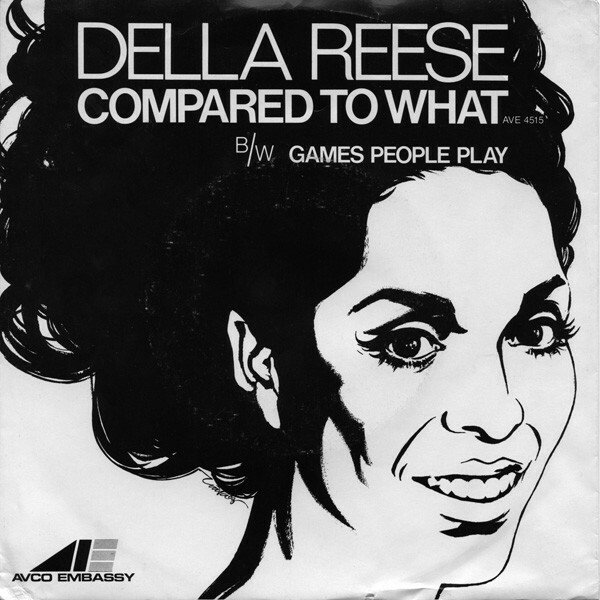 Side A: "I Got a Name"
Della Reese (R.I.P. November 19, 2017) emerged from Detroit in the late '50s as a true glamour figure, delivering her distinctly enunciated vocals to opulent tracks evoking velvet gloves and crystal chandeliers. The pop production team of Hugo and Luigi handled her biggest hit, "Don't You Know" (built on a theme from Puccini's La Boheme), and although that song's momentum also pushed it to #1 on Billboard's R&B chart, Reese's name only ever appeared in the lower regions of the pop singles chart after 1960. Her absence from the R&B/soul charts is indeed a curious aspect of her musical history. "Compared to What" helped the singer Gene McDaniels transition from an on-stage vocal career to an off-stage songwriting career. His three biggest records as a vocalist ("A Hundred Pounds of Clay," "Tower of Strength," and "Chip Chip")—each of them top ten hits—all happened in 1961. In 1966 he'd written "Compared to What" while thinking, according to an online interview, about the "right wing push toward globalization [and] privatization" that alienated "the normal people of the world." He wrote the tune with jazz pianist Les McCann in mind, whose trio McDaniels sang with in nightclubs until label quirks in his emerging pop career complicated the two men's relationship. "Compared to What," then, not only mended fences between the two, but re-joined them at the hip when a 1969 live recording by McCann (who'd done a studio version in '66) became a #85 pop hit—a surprising development for a track on a jazz album. The song's message resonated and cover versions proliferated. Della Reese's version from her Black Is Beautiful album, on a strong, socially-conscious single pairing it with Joe South's "Games People Play," did nothing more than bubble under the pop charts and made no R&B showing. Reese returned to her gospel roots for her version of Joe South's "Games People Play" and gave it a definitive, show-stopping rendition. Those who give this record a listen will feel its message in their bones. Although it charted slightly higher than its intended A-side, one still wonders if anyone ever really heard it. Who played piano? The Black Is Beautiful album's musicians receive no credit despite the gatefold cover's ample real estate. 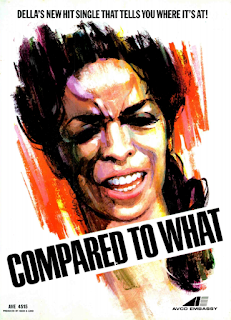 Although a shorter, three-minute-plus version appeared on later compilations, the full five-minute-plus track appeared on both the original album and 45. 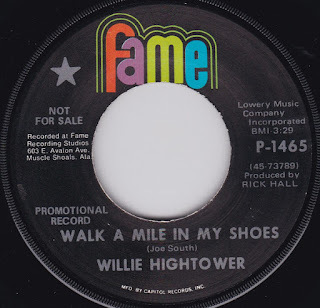 Side A: "Compared to What"
Side B: "Games People Play"
Without fail, the voice of Alabama soul singer Willie Hightower stuns listeners for its expressive power and for the low number of records it actually appears on (especially when considering that he performs live to this day). At least three must-hear singles are his 1966 version of "If I Had a Hammer," his 1969 soul hit "It's a Miracle," and his 1970 Fame label take on Joe South's "Walk a Mile in My Shoes." Sounding like what writer Tim Tooher describes as a "cross between Sam Cooke and Little Richard," Hightower brings out even more dimensions of pathos and humanity from the song. The final paragraph of the Tooher piece mentions producer and Fame label head Rick Hall's success with the Osmonds as being a potential factor in the label's decision to drop soul singers like Hightower and Clarence Carter, and you can't help but wonder how much that might have hurt Hightower's long range momentum. The track "You Used Me Baby" on side B is another grade A vocal showcase and credits Hightower as the sole writer. Side A: "Walk a Mile in My Shoes"
Side B: "You Used Me Baby"
Listening to Joe South's late '60s and early '70s records, especially the ones espousing brotherhood and genuineness, can be a rejuvenating exercise. The Georgia singer-songwriter made a name for himself in the music biz as the writer of "Down in the Boondocks," a #9 hit for Billy Joe Royal in 1965. His own amiable singing voice became familiar to radio listeners with his #12 hit "Games People Play," a 1969 electric sitar-enhanced song possibly inspired by a 1964 self-help book by Eric Berne. "Don't It Make You Want to Go Home" (#41), his next hit, imagined an irresistible rural homeland that South (a stage surname for the man born as Joseph Souter) gauzed with a blurry guitar to signify fantasy. The guitar effects in both of those records, in fact, made for appropriate accompaniment for the 3D image—with its counterbalancing suggestions of illusion versus truth—on his 1970 greatest hits album. The Joe South of the early seventies was even more successful as a songwriter for others. Aside from his own humanist hit "Walk a Mile in My Shoes," he wrote the career-defining Lynn Anderson smash "Rose Garden" and saw the Osmonds go Top 5 with his "Yo Yo." Unfortunately, the melancholy he advised against in "Rose Garden" became a palpable component in South's own music career, which had stalled by the mid-seventies. 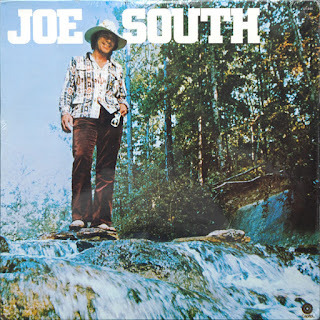 The slowdown coincided with the 1971 suicide of his brother Tommy, who was the drummer with South's band The Believers, but it's worth remembering that Joe South, who passed away in 2012, lived an ostensibly happy life well past whatever challenges he'd gone through in the '70s. 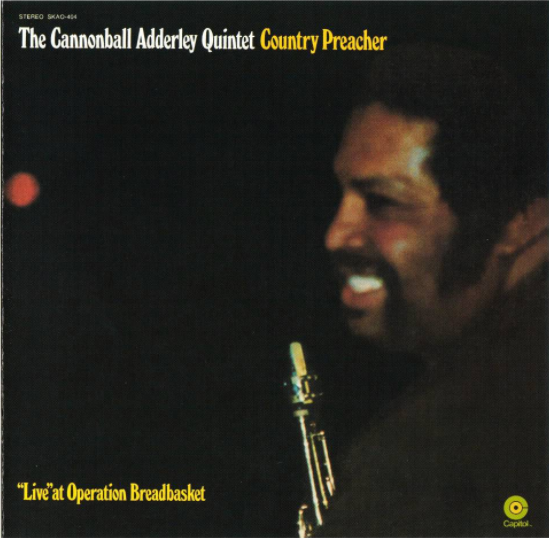 Musically, we can keep honoring him as a man who, in "Games People Play," gave us one catchphrase in particular to live by: "To hell with hate!" Here are all the tracks (with B-sides) sung by Joe South to appear on a Billboard music chart in the early '70s. A list of charting songs written by him but sung by different artists follows. 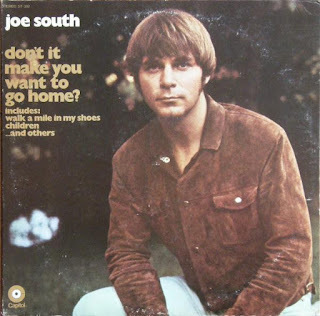 Released in 1969, Joe South's "Walk a Mile in My Shoes" entered the charts in early 1970 as a quintessential track for the times, sounding out from radio speakers like a Sunday broadcast from a new kind of southern church. Handclaps and gospel choruses merged with organ and guitar to support words in favor of awareness for those "in the reservations and the ghetto" and the need to "get inside each other's minds" before we "criticize and accuse." Elvis Presley included the song as part of his On Stage February, 1970 album and gave his apparent fondness for the title phrase added traction. (Doyle, Mieder and Shapiro's 2012 Dictionary of Modern Proverbs traces the phrase back to 1930, noting the occasional exchange of "shoes" with "mocassins" and attributions that have alternated between Native American tradition and Confucius). 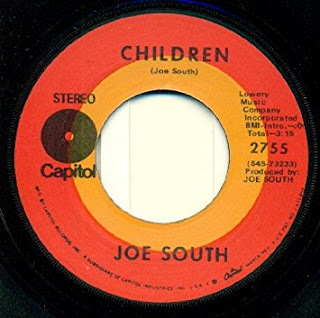 The labels on this 45 and the one before it ("Don't It Make You Want to Go Home") listed the artist as "Joe South and the Believers," who included his brother Tommy South on drums, Tommy's wife Barbara on keyboards and backup vocals, and John Mulkey on bass and backup vocals. The B side, advocating for letting "love be your shelter" and additional church choir voices, kept the new humanist gospel vibe afloat. 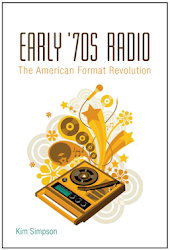 Children were one of early '70s radio's prevailing themes, so hearing Joe South singing about them and adding in signal sounds like recorders and the "na-na boo-boo" seems only natural. From South's "get real" perspective though, the take home message is that all children eventually have to leave their "world of make believe" someday. For the side B, South toys with the theme further in the context of lost romance, asking "what does true love mean to a kid acting smart?" Its tick-tock sounds are there to accentuate the record's lost time motif, but they also manage to give it a kid-friendly appeal. 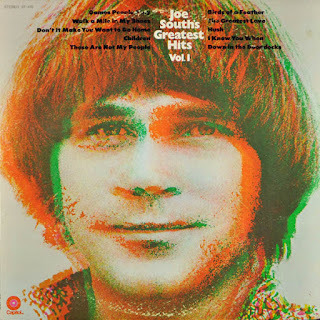 Side B: "Clock Up on the Wall"
In his 2015 memoir You've Heard These Hands, the keyboardist and composer Don Randi (a regular with the legendary "Wrecking Crew" studio players in LA) recounts the unlikely scenario of getting Joe South to do someone else's song. "Why Does a Man Do What He Has to Do" was written for an Alan Sidaris documentary called The Racing Scene about the actor James Garner's Formula One racing activities. Randi reports it as a co-write between him and his friends Bob Silver and Pete Willcox (who received no credit on the label). Because South was Garner's "favorite artist," he asked Randi to work his publishing contacts (and handing him five hundred bucks) to see what he could do. Although the ultimate whereabouts of the cash is unknown, it resulted in a phone call from South who treated Randi to a freshly adrenalized playback of the re-recorded tune that eventually did appear in the film and bubbled under Billboard's Hot 100. The electric guitar quotient might be highest on this track then on any other Joe South recording, but the identity of the lead player seems to be lost. Was it South himself? Side B contains a track from his 1969 Don't It Make You Want to Go Home, with a generous serving of that album's echoey strings and choruses. Entitled "Be a Believer," it was a fitting bit of output from South, who would credit his work as "A Positive Production" on label stickers. 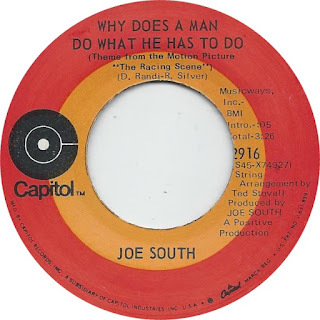 Side A: "Why Does a Man Do What He Has to Do"
Side B: "Be a Believer"
Joe South's 1971 self-titled album rounded up some of his own versions of songs that had been done—or would soon be done—by artists with greater success. In the case of "Fool Me," South's own interpretation, with his pained vocals, was the greater artistic success, while Lynn Anderson's too-perky version in 1972 reaped the commercial rewards. Her willing romantic dupe in "Fool Me" seemed like some sort of self-rebuke for coming off as such a strong woman in "Rose Garden." The hurt in South's voice likely had as much to do with the sad reality of his brother Tommy's suicide in 1970, which darkened what were otherwise his most fruitful years as a songwriter. He'd release three more albums in the '70s, none of which produced any hits. On side B is "Devil May Care," one of the album's lesser products that was produced, like the A side, by two Georgia music business legends—songwriter Buddy Buie and publisher Bill Lowery. Side B: "Devil May Care"
From Dayton, Ohio, Green Lyte Sunday formed around the nucleus of Mike Losenkamp, formerly of the Cyrkle, and Susan Darby of the Mark V. (Losenkamp had also been a member of that group; the annals of pop history indicate that this was a popular band name used by multiple parties, so research carefully.) The group caught a break when they came to the attention of British ex-pat Peter Shelton, who'd played with Ohio's Outsiders and worked as tour manager for Chicago's Buckinghams. He helped the band land a contract with RCA Victor and wound up producing their self-titled album. With their jazz-rock inclinations, the group transitioned easily to the tastes of MOR radio. 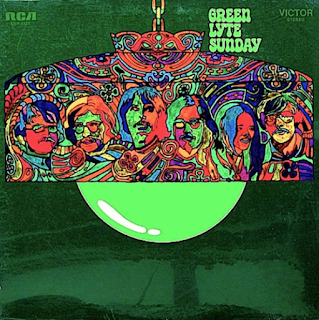 Their version of Joni Mitchell's "Chelsea Morning," billed on the 45 label to "Green Lyte Sunday Featuring Susan Darby," had an airy, flutes-and-vibes mood and a gentle groove that may have conceivably informed a later iteration by Sergio Mendes and Brasil '66. (That band's Stillness album came out late in the year, even though its leadoff single "For What Its Worth" had been released in August.) Side B of the single covered Laura Nyro's "Emmie," also from the album, which mostly featured original songs by Losekamp. 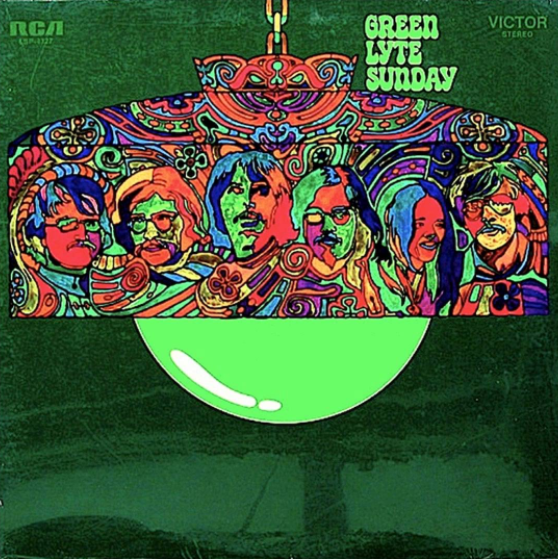 After this one-off LP, Green Lyte Sunday continued as a popular local attraction. One brief mention of Susan Darby in a 1979 Billboard (February 3) reports her signing to Umbrella Inc. for exclusive representation. Various online hearsay reports locate her as a Vegas club singer who may have become a music biz casualty. An earlier single by her as "Sue Darby" doing Question Mark and the Mysterians' "Can't Get Enough of You Baby"—and giving Evie Sands a run for her money—can be heard on YouTube. Directed by Barry Pollack, Cool Breeze did whatever it could to live up to the term "blaxploitation." On display most prominently were the era's favorite caricaturizations of urban blackness and, as a dreary bonus, an unwavering commitment to chauvinism. Its biggest mishap, though, was closing credits that stunned viewers by even being there. Their first line should have read, "we didn't know what else to do, and we're out of money, so we're just gonna end this." Even so, Cool Breeze does have the makings of a cult movie (which it's becoming) due to its funny dialogue and time capsule visuals, such as scenes where Thalmus Rasulala's assembled gang of diamond thieves wear Nixon and Agnew masks. 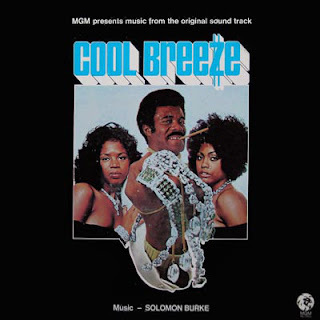 The choice of influential R&B singer Solomon Burke—whose chart success was on the wane after a busy 1960s—as the movie's soundtrack man is apropos because he, like the film, had something of a world-tainted preacher aura. As his obituary in the New York Times reports, Burke was known in his youth as a "wonder boy" at the pulpit whose competing love for life's temporal pleasures led him toward a music career that made them all available. (As the "king of rock and soul," he would appear on stage wearing a crown and robe.) In the film, a preacher who's also a safe cracker joins the heist squad, and one scene in the film has three of his cohorts awkwardly discussing business on a church pew, surrounded by elders and children who are trying to worship. It's a scene full of inner angel-devil conflict that Burke probably appreciated. After the soul chart (and minor Hot 100) success of "Love's Street and Fool's Road," which features the kind of spoken interjections he was known for, Burke had only one more Hot 100 appearance and two more on the soul chart. In 2002, though (eight years before his death), he'd release the rally-round comeback album Don't Give Up on Me, full of songs by contemporary songwriting icons. Side B previewed a song, written by J.W. Alexander and Willie Hutch, that would later show up on Burke's We're Almost Home LP the same year. Side A: "Love's Street and Fool's Road"
Side B: "I Got to Tell It"